In Western Town players take the role of a Marshal in the expanding American West of the 1860s. Each Marshal attempts to develop the most prosperous town, a town which President Lincoln himself would be proud to visit. 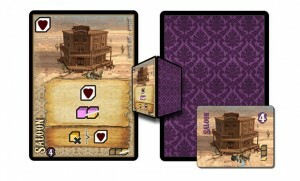 Players will each have their own board where they will build their western town. The three main criteria for winning are the population of your town, the charm and attractiveness of you town and finaly the gold you will accumulate to give to the nation. The turns are regulated by the visits of President Lincoln who declares bit-by-bit the value of the three criteria. The value of these criteria can change every round so you need to adapt in order to win! Western Town is currently a project in need of support to reach production. Being based in France, the designer is unable to use kickstarter as a means to get support from U.S. gamers. Luckily there is a site that is the French equivalent called ulule.com. The support levels made for the U.S. are: "export 2", "4", "6" and "export 10." To reduce the impact of delivery costs – add only €15 for delivery (~20$). To learn more about the game, download the current rules PDF, and give it your support, visit the link below. Add a Review for "Western Town"